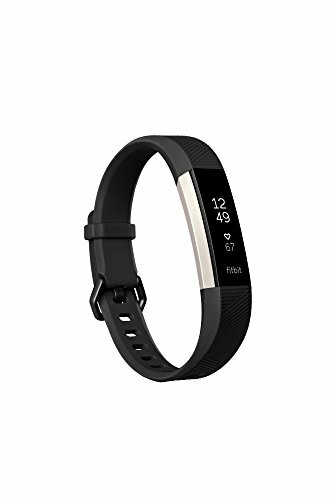 The Alta HR Wristband is Fitbit's slimmest heart rate monitor, and while it's an excellent choice for fitness training, you'll end up wearing it a lot more than just at the gym, on the treadmill, or at the track. Its PurePulse obviously shines when you're working out thanks to better calorie burn tracking and more insight into your health than any Fitbit band has ever offered before, but Alta's SmartTrack auto-recognition also records how many miles you walked or commuted for a complete registry of your overall fitness. This smart little wristband also records your sleeping habits throughout the night, syncs with your smartphone to deliver calls and texts, and will remind you to move if you've been slightly slothful. The customized clock and replaceable bands let you find a look and style that best suits you. Syncing range: Up to 6.1 m, Syncing requires Bluetooth LE and Internet connection. Windows 10 computers that do not have Bluetooth LE will need a wireless sync dongle in order to sync. Syncs with Mac OS X 10.6 and up, iPhone 4S and later, iPad 3 gen. and later, Android 4.4 and later, and Windows 10 devices. Care: Alta HR is rain, sweat and splash proof, but not shower or swim proof. If your tracker gets wet or if you sweat in it, remove and completely dry the band before putting it back on. Give your wrist a rest by taking the band off every now and then, and regularly clean your band and wrist.